From star director of The Host and Memories of Murder, Joon-ho Bong, comes another masterpiece of Korean drama - Mother (Madeo). 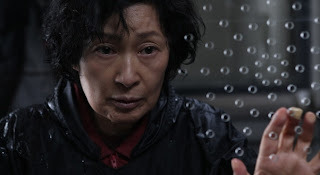 Multiple award winner, for best direction, best lead performance by veteran Korean actress Hye-ja Kim, and even official South Korean submission for Academy Award for Best Foreign Language Film at the 82nd Academy Awards. A mother (Hye-ja Kim) and her son (Bin Won) live in small Korean city. She's widow with no support left with her mentally challenged son who has severe aggression problems. Struggling to get by, she is illegally performing acupuncture procedures on local woman. One day a body of murdered local school girl is found on rooftop in the middle of town. Local police in hurry, based on circumstantial evidence arrest her son, soon confession is forced out of him, and he is convicted of murder and faces to spend rest of his life in mental hospital. Mother however knows that her son couldn't perform such cruel act, and sets to find the real culprit on her own, causing quite a commotion in this ,as it appears, not so calm city. She is set to prove her son's innocence by any means necessary. As with Memories of Murder Joon-ho Bong takes another look into mentality of small towns. He skillfully plays with such forces as maternal love, commitment to the cause of family. Filled with mystery and tension this movie doesn't let it's grip till the moment credits roll. If you have seen excellent crime thriller The Man from Nowhere you might (or might not) recognize young Korean superstar Bin Won, whose role there of hardened special forces agent is complete antithesis of his portrayal of Mother's son in this movie. Currently director Joon-ho Bong is working on his Hollywood debut, science fiction thriller Snow Piercer, set to be released in October, 2013. Powerful performance by lead actress, beautiful cinematography, exceptional directing, twists here and there, and long lasting emotional residue. What more is needed for great drama? Must see.